a2b music was an attempt at creating a digital music delivery system by telecommunications giant AT&T, fresh from the recording industry scare caused by the sudden popularity of the MP3 format. The system was launched to much fanfare in the late nineties, touting wide industry support and much better quality than alternatives (because it was using the AAC format, instead of the more common MP3). Of course, the tracks on sale were heavily protected with DRM schemes. To add insult to injury, the software requires that you install RealPlayer to enable streaming (to see my lenghty rant about Real crapware, read the RealJukebox entry). a2b folded rather spectaculously before even becoming relevant, when the majority of its employees decided to walk out and join a competitor less than 2 years after it was founded. For that reason, the player I am hosting here is rather useless now (unless you want to stare at an interface so ugly, it borders on the indecent). 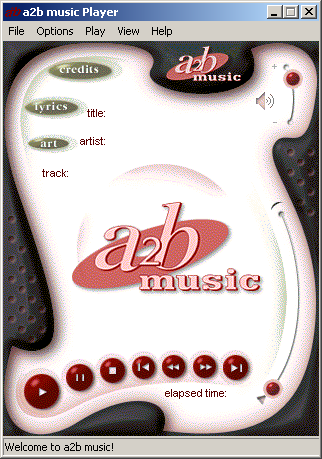 Talking about cutting-edge design, make sure to check this archive of the a2b music website, for some real eye candy. Big thanks to Zachary Jelesoff for sending me the a2b music player and introducing me to the story of AT&T a2b.